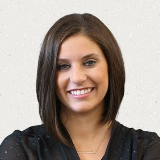 Jordan Arnold is a Brand Strategy Director at Terakeet, an engagement marketing company that helps brands connect with influencers online. Jordan Arnold from Terakeet walks through how to use HARO to generate content ideas for your website & connect with influencers in your niche. I recently read Christopher Gimmer’s article on using HARO to build backlinks and get press. 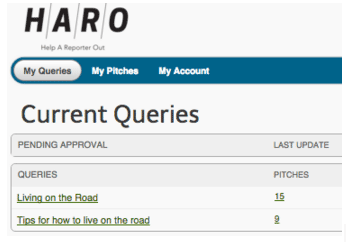 Christopher’s article focused on the ability to sign up for HARO as a source to respond to queries from journalists. Excitingly enough for anyone who found his article helpful, there’s a whole other side to HARO that can be used. In this post, I’ll walk you through the process of using HARO as a journalist, rather than a source, and the many benefits that can come from doing so. 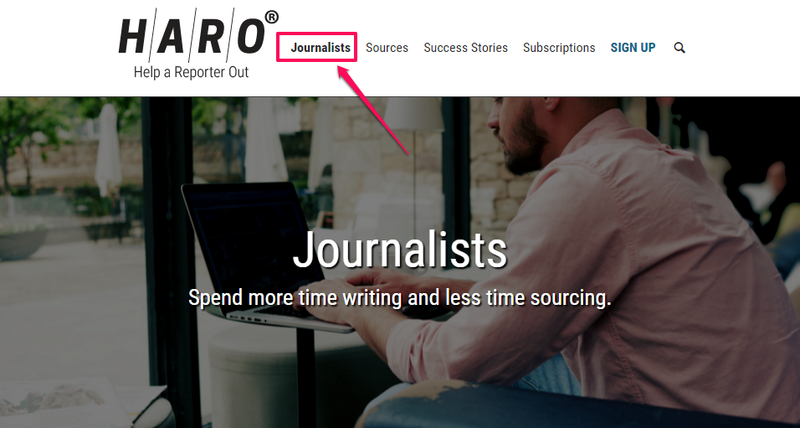 Christopher’s article explained what HARO is, but just to refresh, HARO (which stands for Help A Reporter Out) is a free resource aimed at journalists and other writers who need expert sources quickly. There are 2 ways that you can sign up for HARO. You can either be a source or a journalist (or both). 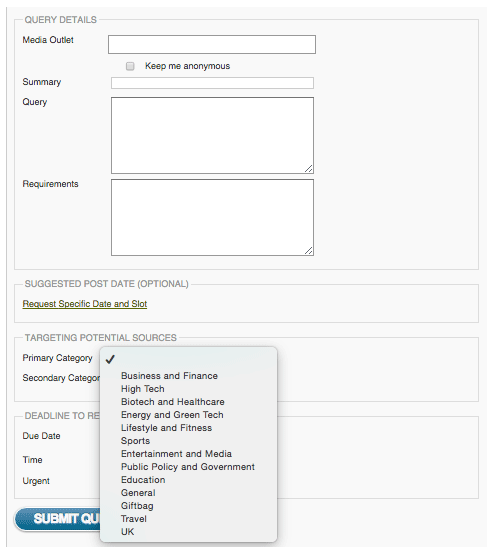 As a source, you’ll get three curated emails a day outlining stories that journalists need sources for. As a journalist, you’re the one sending out queries for stories that you’re writing, and the sources are coming to you with their pitches. Here’s what it will look like when you are creating a pitch as a journalist. The “Summary” is what gets sent out in the emails, so make sure it’s compelling. The Query is your actual ask. You can get as detailed as you want here, but try to keep it concise so that people don’t skip over it. Requirements are great for stories which need “verified” sources. For example, if you put out a pitch looking for people to comment on the impact of cow’s milk in our diets, you would want to make sure anyone who answered you was credible, so you could make it a requirement that anyone who answers has some sort of medical credentials. There’s a dropdown menu so you can pick your category and narrow down who you’re searching for. The emails still go out to all sources, but since there are three emails a day, some people just skim the category they fall into, so you want to make sure you use this wisely! Lastly, you can choose your due date. There is even an “urgent” checkbox if your due date is fast approaching; HARO will take some extra steps to push your request out faster. Now that you’re signed up as a source and you’ve seen what it looks like to submit a query, I’ll talk through a step‐by‐step process I like to use to come up with great content ideas. As my title suggests, this will also help you create relationships with influencers and hopefully get some awesome placements! Let’s say that you own a business that sells travel gear and you want to get in front of some adventure‐minded people. You know you want adventure‐seeking consumers, but how do you ensure the creation of content that will intrigue them? There’s no real need to take a risk here and try something that nobody has ever done before. Instead, take a few minutes to investigate what type of “adventure/travel” content is popular on the web right now. Discovering existing ideas will help you identify the types of content working already. Copying people won’t get the job done, but you can certainly think tangentially in how you can relate it back to your brand, or even create a unique spin on it that answers further exploratory questions. 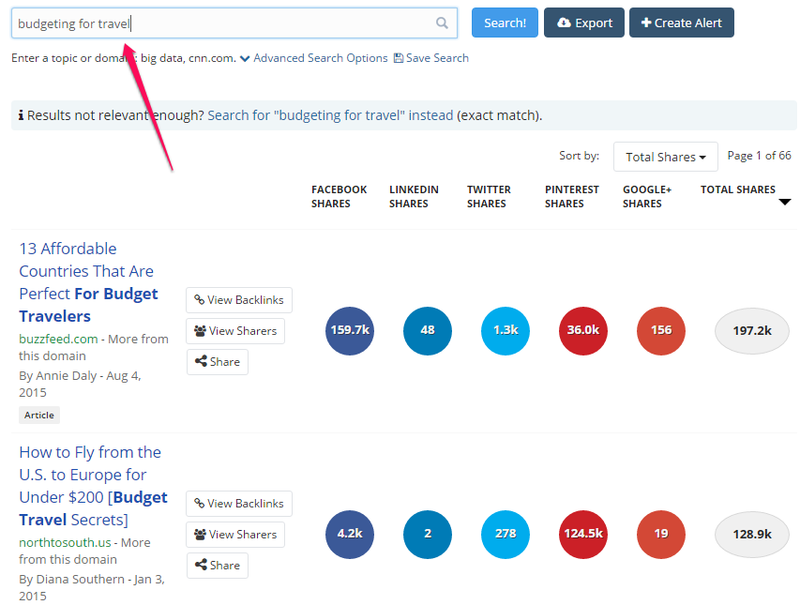 One of my favorite discovery tools for this process is Buzzsumo. It lets you quickly analyze what content is performing well on a certain topic, and you can get as granular or broad as you want with it. I started simple and did a search for “adventure” on Buzzsumo just to see what’s out there and doing well right now. Okay, so we see here that people are really into the idea of spending their time and money on “experiences” rather than material things. What if we take that thought and search another adventure related term, like “wanderlust”? From two simple searches, we can see what types of content people like to share related to adventure. Use these general themes with your team to come up with an idea for your pitch and the resulting content you’d like to create from it. Using a simple example, we decided to go with an article that highlights some tips and advice from those who actually did quit their jobs to live on the road. Stories like this always seem to be very successful. Sure, the thought is a little extreme (how many people will truly do this? ), but through further research, we found that content about people “dropping it all to live their dreams” does really well. 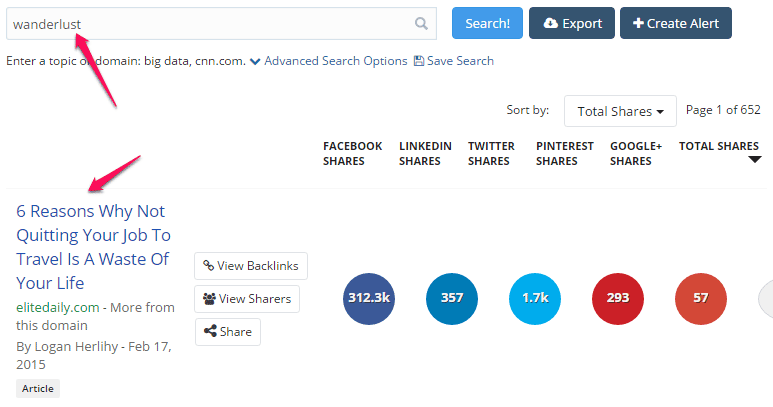 Buzzsumo is admittedly a very strong tool. But you can also find popular content ideas that generate tons of social shares and backlinks right here in Ahrefs in our own “Content Explorer”. It incorporates a bunch of in‐build filters to help you find the most relevant content. In a single click you can get a list of Twitter users who tweeted this content. 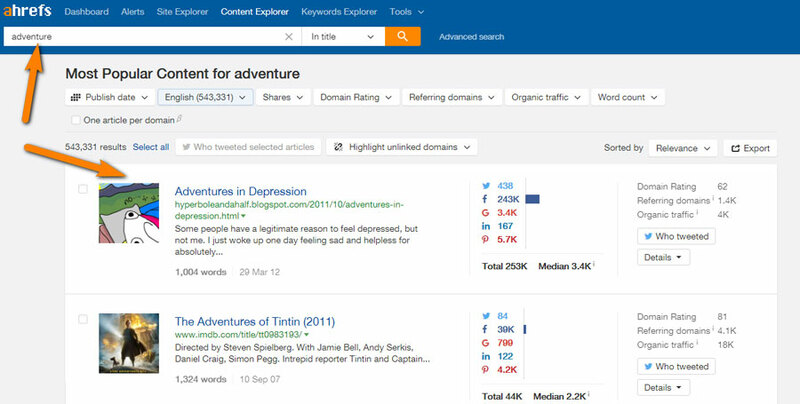 Content Explorer can even point you at domains, within the search results, that never linked to your own website. Sign up for a 7‐day trial to try it out and get instant access to all our tools! I submitted two different pitches for this idea. One that was broad (I really wanted to get in touch with people who live on the road) and one that was specific (this one instructed people to give me actual tips in their response). We received 15 responses to this query, and 9 to the second one. That’s 24 contacts who potentially fall into your target market that you probably weren’t in touch with before. Okay, the leg work is done. Now, let’s figure out how we can use these new contacts and their responses to generate some buzz (and placements). First, think about creating a blog piece using all of this great information. The important thing to remember is that people who are signed up to use HARO as a source did so because they want publicity. If you use their quotes and information in your article, you can bet they are more likely to push it out to their networks. And because you targeted people with the same mindset as your target consumer, their network is your network! Hopefully, as they share the article, others in their network will pick it up and continue to share and engage with the content. Track down anyone else who ends up sharing the article and start a new relationship with them. You can thank them for sharing and ask if they’d be interested in publishing more of your content in the future. This can open new doors for you to establish new relationships and grow your ‘inner circle’. Most people would create the content they set out to create and stop there, but there are still many things you can do with all of these responses. Take a deeper look at the responses you received from a different angle this time. The original blog post is about tips to quit your day job and some anecdotal stories of those who have done so. If we look through the responses, we may find other angles to use for content in the future. You created a plan, you say? Tell me exactly how you created it. How did you break down your budget? Can we work together to create content that will help others make their own “wanderlust savings plan”? Viewing the same sources from a slightly different angle will give you even more ideas with no extra work on the front end. This could be a whole new piece of content. Clearly, we’re on to something here. We may not have ever thought of this angle if we didn’t go back to our original sources and dig deeper. Rather than just sharing it on your own blog and relying on your sources to share, don’t forget your ability to pitch this content to bigger publications and other relevant blogs as well. 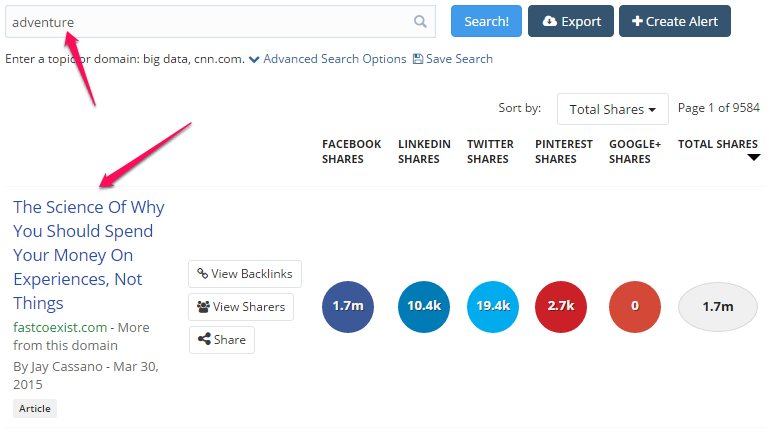 Go back to Buzzsumo, see who’s shared similar content before, and pitch them with your piece. Finally, remember that HARO is a great way to grow your network of partners, sources. If you find someone who helps you create killer content, keep them in mind for future projects. They might even have ideas of their own that you can help develop to continue growing a mutually beneficial relationship. You certainly don’t want to abuse the privilege of being a source on HARO, and you definitely don’t want to harass people. If you can do it in an appropriate way, you can use the responses you get to create your own little network of great resources. Never underestimate the power of a trusted source in a community. Bottom line is, HARO is the gift that keeps on giving, as long as you use it in a respectful way and don’t abuse the system!